Even though the current stadium is relatively young, it has remained forever true to its predecessor and rich history. Many of the design elements of the original stadium have been replicated in its new incarnation. Yankee Stadium Tours: Getting Up Close to History! Exciting insights about the very beginnings of the iconic team and its players can be found on a tour of Yankee Stadium itself. The New York Yankees Museum presented by Bank of America offers a unique addition to an already intriguing day of exploration. Here, there’s an opportunity to see a well-preserved display of signed baseballs from great Yankees players, hailing from every era of the team’s history, as well as uniforms and gear from classic Yankees favorites. 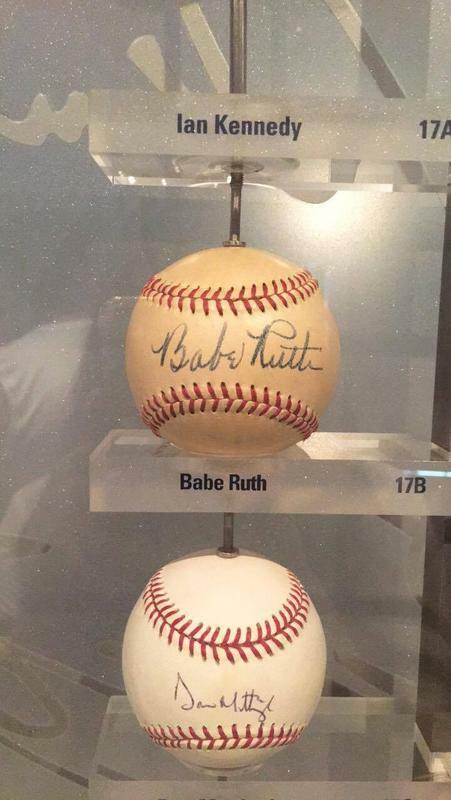 Babe Ruth’s notched bat, commemorating several home runs the legendary player hit during the 1927 season, is on display, as well as belongings from the retired # 4, Lou Gehrig, #5, Mickey Mantle and a long list of others. In honor of the late catcher and team Captain Thurman Munson, his locker was sealed and kept in the same condition he last used it prior to his untimely death in 1979. It was transferred to the new stadium from the old one in the same manner. Nowadays, we can even witness a comparison between the locker design then, and the fancy spaces the players get to use now, which are equipped with latest trends and technology. We stopped at Monument Park on our way to view the playing field and saw the retired numbers from other Yankee greats throughout the team’s history. 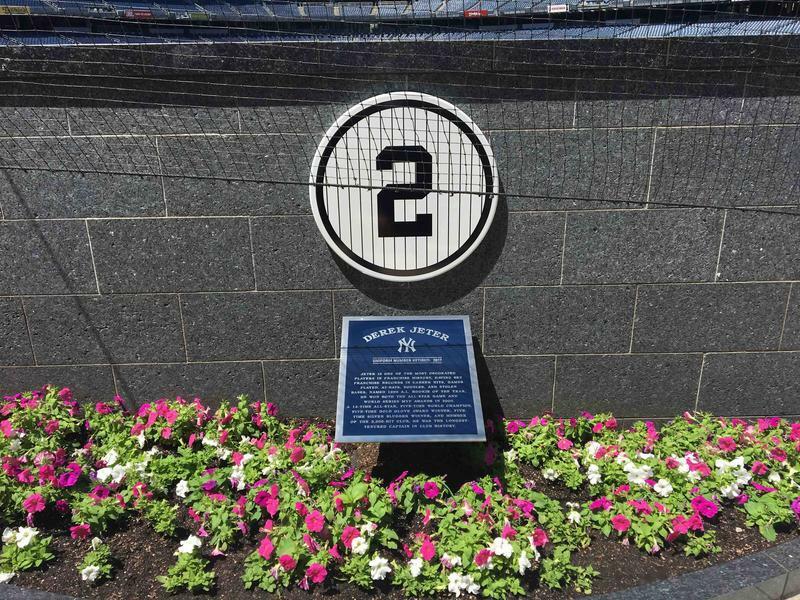 Derek Jeter’s #2 is now proudly on display and the most recent number to be retired. The Yankee Stadium Tour also provides a magnificent overview of the vast playing field itself, and is truly a very unique opportunity to witness the stadium in complete, almost sacred silence. It is also interesting to mention that the immense space of Yankee Stadium is not only used for baseball, but it has also been a proud host of several other sporting and organized events, as well as concerts, since it opened in 2009. The third and final stop on the tour is either the Yankees dugout or the Press Box. Both sites offer unique and exclusive views of the Stadium that you cannot get access to anywhere else. Lucky for me, we got to go to the dugout on my recent tour! While in the dugout it’s almost as if you can feel the rush of the breathless players, cheers of the excited crowd and the overwhelming emotional swings of the coaches. Yankee Stadium is truly a unique place that represents a proud and well-documented legacy. It’s a place that pays homage to talent and devotion, and welcomes those who recognize it. The field is one of the core pieces of NYC history and one of its eternal pillars, holding many of the city’s greatest stories to tell for decades to come. Click Here for More Information, Including Pricing, Yankee Stadium Museum Hours and to Buy Yankee Stadium Tour Tickets!